A lazy-but-loyal cowboy and ranch hand that works for High Loper. It is unclear how long Slim has worked at the ranch, but despite several comments made about wanting to move to a bigger operation, he has never quit. He does most of the work on the ranch that Loper does not want, and occasionally gets forced into babysitting Little Alfred, for whom he has an affinity. Slim lives in a run down shack two miles from ranch headquarters, and maintains a filthy house. He frequently leaves old dishes, clothes, food, and livestock magazines lying around, therefore he has bad rodent problems which Hank must help him combat. He also hates cooking, which results in him maintaining a horrible diet and eating things that would disgust the average reader, like sardine and ketchup sandwiches. 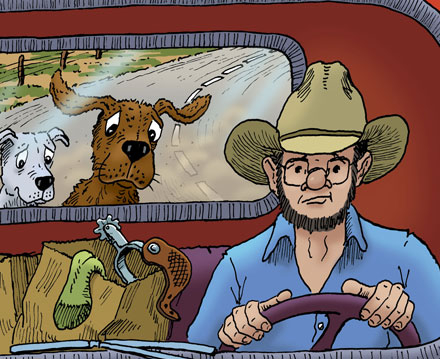 Although Slim loves to play pranks on Hank and poke fun at him, it is clear he has an affinity for both him and Drover, frequently asking them to come along with him on odd jobs.